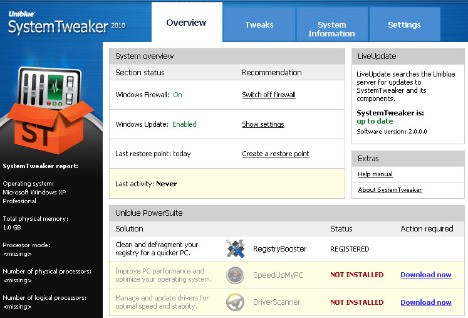 SystemTweaker from UniBlue is a safe and easy-to-use utility software that quickly applies useful Windows tweaks, without the hassle of browsing, or the potential damage when editing in registry to enhance PC performance, speed, and stability. The new version of SystemTweaker 2010 comes with numer­ous enhancements. Visit PCAuthority.com.au to create an account. Note: if already have an account on V3 store, users can use it to login to PCAuthority website. Enter the name and password, and then click “Submit” button. Note: Make sure entering a valid password to received free license code. 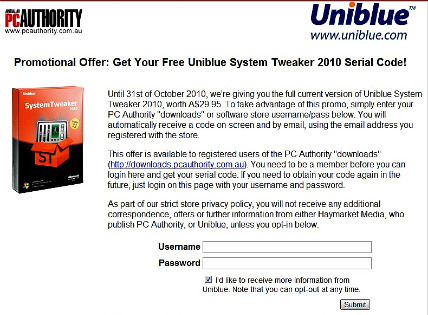 Use the received license code to unlock and activate UniBlue SystemTweaker 2010. UniBlue SystemTweaker 2010 supports 32-bit and 64-bit system, and is compatible with Windows XP, Vista and 7.